← Convert prn to bmp and set color depth via command line? 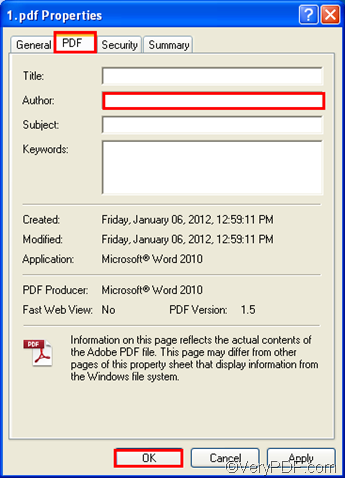 Normally, people will use the following way to edit PDF author: right click the icon of the PDF file, > click Properties to open the Properties dialog box, > click the tab PDF, > edit PDF author in the Author edit box,> click OK. If you have to convert HTTP link to PDF and edit PDF author, before you edit PDF author, you have to convert HTTP link to PDF first, and that may take a lot of time. To convert HTTP link to PDF is not very hard. But to effectively convert HTTP link to PDF and edit PDF author, you should try VeryPDF HTML Converter Command Line, which is a stand-alone application and does not require any third party product like Adobe Acrobat. The most important thing is that it allows you to directly type a HTTP link in the command prompt window to represents the corresponding web page. You can download this command line application by clicking VeryPDF HTML Converter Command Line. The following will show how VeryPDF HTML Converter Command Line can help you take two steps to solve your problem via command line. Click Start, > click Run to open the Run dialog box, > type cmd, > click OK.
D:\htmltools\htmltools.exe represents the executable file which is placed in the folder named htmltools, and here this folder is on disk D.
-author "bee" is the option that can be used to edit PDF author. bee is defined as PDF author. After you type a proper command line, press Enter on the keyboard to start converting HTTP link to PDF. Don’t you think this method is simple? If you want to get more information about VeryPDF HTML Converter Command Line or buy it, please visit the product page by clicking Purchase. How to rotate the page while converting wmf to pcx? This entry was posted in HTML Converter (htmltools) and tagged command line, edit PDF author, HTTP link to PDF. Bookmark the permalink.